The UART-B1 is a low cost full RFID/NFC read/write device with UART interface. Can operate in “host” connected mode or “stand alone” mode. Supports MIFARE Classic® 1k, MIFARE Classic® 4k, NTAG2xx® and MIFARE Ultralight®. Additionally, you can read serial numbers from MIFARE Plus®, MIFARE® DESfire® and any transponder compatible with the ISO14443A standard. 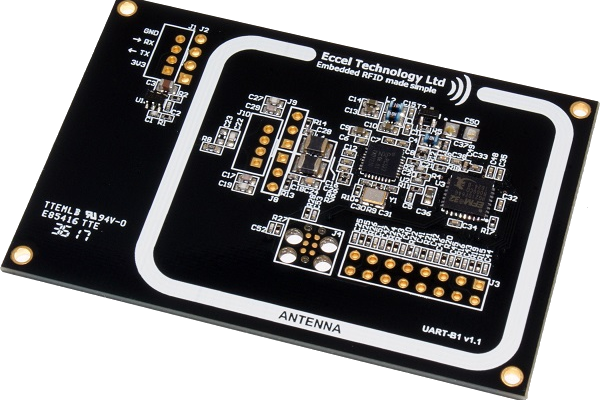 The UART-B1 is based on our RFID-B1 module but is equipped with an additional integral antenna, an LED for tag in the field indication/ interrupt, mounting holes and flexible plated connection holes. The UART-B1 is an ideal choice if the user wishes to add RFID capability to their design quickly and easily. This device enables high performance RFID solutions to be devloped without the requirement of any RFID expert knowledge on the part of the User. This applies equally for designs based on single board computers such as Arduino, or bespoke designs based on connection to a host microcontroller. Furthermore, a wide range of peripherals is available on the module, such as a comparator, DAC/PWM and digital IO. These can be configured and accessed by specific commands and control registers. For a quick test the user can also use a UART-USB converter and simply connect the UART-B1 to a computer and then start the B1-client application which allows the user to test all features of the device. The B1-client along its user guide can be downloaded from here. The best read range (about 50mm) can be achieved when the tag is parallel to the surface of the reader. Please see also our other modules here.